National Geographic just posted an article that includes CRISPR technology, gene drive, and mentions the situation of avian malaria in Hawai'i (link). In related news, we just resubmitted our application to NIH, again, for funding to to use CRISPR and gene drive technology in genetically modifying Culex mosquitoes to address both avian malaria in Hawai'i and human diseases. This entry was posted in Uncategorized on July 20, 2016 by Floyd A. Reed. Vox posted an article, "The 7 biggest problems facing science, according to 270 scientists". I would have cast some of it differently and there are some alternative issues I might have focused on but it is worth reading over. It closely mirrors a conversation I had with a grad student last week about struggling to deal with a feeling of cynicism and pessimism in science versus trying to stay positive and focused on research. The section headings are copied below to give you a feeling of what is discussed. "Academia has a huge money problem"
"Too many studies are poorly designed"
"Replicating results is crucial — and rare"
"Too much science is locked behind paywalls"
"Life as a young academic is incredibly stressful"
This entry was posted in Uncategorized on July 17, 2016 by Floyd A. Reed. Can bacteria or parasites take advantage of RNAi against host genomes? This is an idea I've had floating around in the back of my mind for a few years now. I keep some ideas secret in the short-run because I hope to be able to investigate them some day. However, I also have to face reality, with my teaching load and limited research funding there are a wide range of projects that I simply won't be able to follow up on. I figured it would be better to just put the idea out there so someone can check into this if they want. RNA interference is a widely used and very useful genetics tool where gene expression can be reduced by double stranded RNA that matches the mRNA of the target gene. There is a great deal of literature on this and I am not going to attempt a summary or review of this technology and its natural role here. Instead I want to focus on a curious fact. For a wide range of species you can simply feed bacteria to the organism that have been modified to express double-stranded RNA and this can create phenotypes by silencing certain genes. Okay, if this is so easy and straightforward (and quite short sequences of RNA can accomplish this) have any bacteria evolved to take advantage of inactivating genes of a host Eukaryote? Perhaps as a pathogen to block immunity and promote infection, or in a more symbiotic role to tweak host phenotypes? For that matter have any Eukaryotic parasites evolved this ability to excrete dsRNA or antisense RNA to alter host phenotypes? Part of this is a comparative genomics question and if candidate sites are found the follow-up study of activating or inactivating the gene sequence can be done to see if there is a response across species. This entry was posted in Uncategorized on July 16, 2016 by Floyd A. Reed. 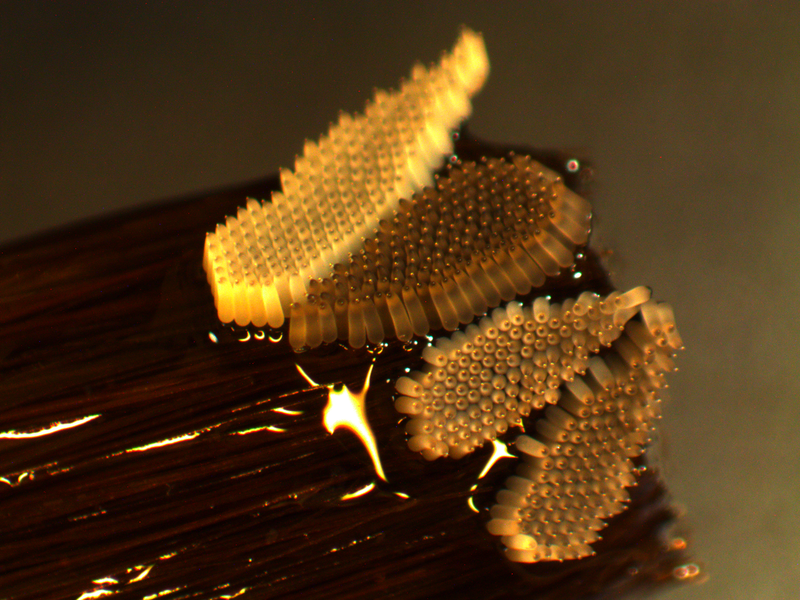 Culex mosquitoes eggs stick together and are laid in "rafts" that float on the surface of water. In the picture above are four freshly laid egg rafts from our lab mosquito colony, each laid by a single female. They are on the end of a paintbrush that we used to lift them out of the water. They get darker as they age. The two lower rafts are almost the same age; the dark one above them is older and the very light one at the top is less than 1/2 an hour old. To prepare them for microinjection you want to use the very youngest one like the raft at the top. They are seperated from each other and arranged on a glass slide and injected using a microscope and micromanipulator for fine detailed control. They also harden as they age and the light ones can be injected without breaking the thin glass needle that is used. Once they harden you have to use a brief treatment with bleach to remove the out egg surface (chorion) which lowers the rate of survival. This entry was posted in Uncategorized on July 3, 2016 by Floyd A. Reed.